Hollanote is an interesting app with a core goal: to allow you to post unique status updates to Facebook. That may seem limiting, but the app really plays with this and lets you update your status with some great and stylish fonts and images. Once you log into Facebook, the app then allows you to start editing and uploading. You can either use a large variety of fonts, font colours and sizes to write a status like you usually would, or add images, faces and emoticon style images to the post. The process of creating all this is very easy, and you will soon be impressing your friends and getting asked how you did it on Facebook within minutes. 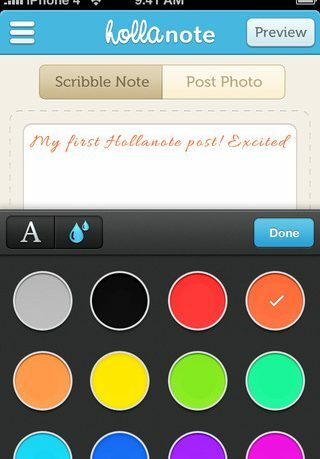 Hollanote is the iPhone app that lets you update your Facebook status the way you want. Post your status with different coloured fonts, different font styles and expressive face icons, or simply add a beautifully designed note background to your status update. 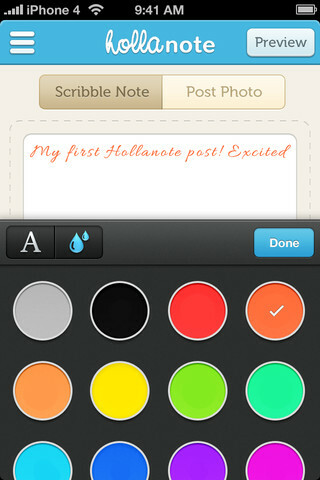 Hollanote also lets you take and upload photos straight from the app and add a stylish title under your photo. The app takes minutes to learn, and is sure to become your first port of call when wanting to update you Facebook status. Even better, the app is completely free to download and use, so if you love impressing people on Facebook, then there really is no excuse not to pick this app up. Overall, this is an intuitive and useful app that proves to be a great companion app to the official Facebook app, and will be sure to get your status posts plenty of attention.